While I was doing research for my second book – one about the founding of the first California mission, told from the point of view of a Kumeyaay (the native peoples of North Baja and the area around San Diego, CA) basketmaker, I chanced to spot a flyer for a class in how to make a traditional willow basket, taught by Kumeyaay basketweavers. The coincidence was not lost on me and I quickly signed up for the class. The basket I made that day was about as ugly a thing as you can imagine, but it served as a talisman during the writing of the novel, and it sparked an interest in basketry that led me to study many different forms of the art before finding the one that spoke to my soul: coiling with pine needles and a variety of other natural materials. My first attempt at making a pine needle basket was awful. The result was so lumpy and lopsided that I shoved it in a drawer and never finished it, convinced that pine needle basketry was not for me. It took another year before I tried again. During that year, I learned to make six or eight other kinds of baskets, and that made all the difference. Although my second pine needle basket was only slightly less lumpy and lopsided, I realized I loved the process: the silky feel and heady aroma of the needles, the soothing repetition of the stitching, the way my mind emptied and quieted. I was hooked. It didn’t take long, however, before I became bored coiling “traditional” shapes. One day I decided to see what would happen if I allowed the bias of the natural materials to dictate the direction of the piece. 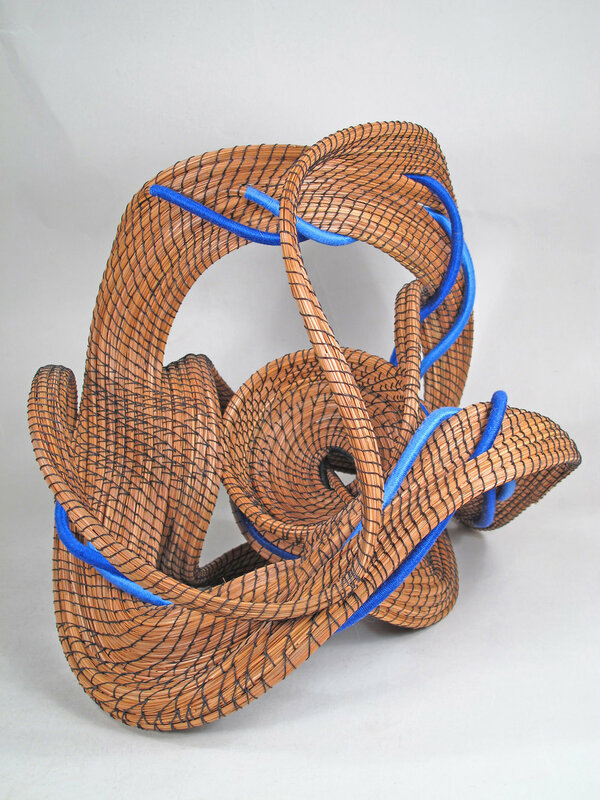 The result was so intriguing and unusual that I knew I was on to something important - something I call “sculptural basketry”. Hundreds of sculptures and dozens of exhibitions across the US later, I am still entranced by the materials and the process of creating my pieces. Not knowing what is going to result when I start a new piece is the prod that keeps me inspired and trying new things. I draw inspiration from the natural surroundings of the Missouri Ozarks where I live and from the worlds of literature, music, mythology and mysticism. Working with natural materials also serves as a constant reminder of the bounty and blessings of this big blue ball we all call home. Your work is really appealing and interesting to study: the shapes are sinewy and organic yet, when combined with your concise stitching, look so intentional and methodical. What role do numbers or repetition play within your artwork? Repetition plays an integral role in each of my sculptures. Adding layers of coils not only strengthens each piece but also adds impact to the forms. I've had professors and students of mathematics comment on how my work incorporates topological forms, although I am not always conscious of creating them. They just kinda happen as the work progresses. My latest venture is a line called “One-Cubed”. “One-Cubed” sculptures are specifically designed to fit in a 12” x 12” x 12” space and to be more affordable than my more elaborate exhibition pieces. I'm a member of Best of Missouri Hands, I have been for many years. I'm also part of Missouri Fiber Artists. I found the FAC through both of those. Also, one of the novels I wrote was about the Lewis and Clark Expedition. Doing research for that book, I became acquainted with Saint Charles and the role it played in that undertaking. Making art is my passion. With each new sculpture goes my wish that it may spark the creativity that lies within those who see it and prompt them to seek out a way to make their lives and the world more beautiful. Besides doing art, I love to spend time with my favorite man, my husband Jerry Orton, to get lost in a novel, to work in my rose garden, to walk around our ranch with our four lively dogs, to do some quilting, and to hang out on our deck and watch the clouds drift by while getting lost in a day dream or two. View the artwork of Peggy Wyman in Gallery I & II of The Nth Degree exhibition at the Foundry Art Centre. Into the Heart of the Matter by Peggy Wyman. Mood Indigo by Peggy Wyman. Remembering the Day in June by Peggy Wyman.